Peter Highman (Robert Downey Jr.) is an expectant first-time father whose wife's due date is a mere five days away. 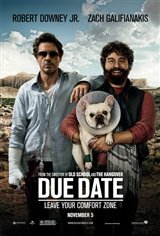 As he hurries to catch a flight home to Los Angeles from Atlanta to be at her side for the birth, his best intentions go completely awry when a chance encounter with aspiring actor and disaster-magnet Ethan Tremblay (Zach Galifianakis) leads to the two of them being tossed off the plane and placed on a no-fly list... while Peter's luggage, wallet and ID take off without him. With no alternatives in sight, Peter is forced to hitch a ride with Ethan and his canine traveling companion on what turns out to be a cross-country road trip that will destroy several cars, numerous friendships and Peter’s last nerve.